The Royal Mints Queens Beast collection of silver and gold coins is truly an impressive offering in the precious metals industry. Slated to feature 10 designs in total, with recent expansion to include platinum and a full proof lineup, theres something for every numismatist from the Queens Beast Series. Right now, 2017 1 oz Proof British Gold Queens Beast Unicorn Coins are available to purchase from JM Bullion. Arrives in a Royal Mint protective box with Certificate of Authenticity. 2nd proof series release and 4th overall design in the Queens Beast Collection! Limited mintage of only 475 coins! Bears a face value of 100 (GBP) backed by the United Kingdom. Reverse includes the Unicorn of Scotland. All 2017 1 oz Proof British Gold Queens Beast Unicorn Coins arrive inside of the Royal Mints beautiful display box. These proof gold coins are one of four available gold options in the Unicorn release, along with a oz, 5 oz, and 1 Kilo coin. The proof series offers 8 options in total, with four silver coins ranging from 1 oz to 5 oz, 10 oz, and 1 Kilo. Mintage figures for the proof coins are extremely limited in the Queens Beast collection. These 1 oz Proof British Gold Queens Beast Unicorn Coins featured just 400 coins available for individual purchase out of a maximum mintage of 475. The highest mintage in the proof range is the 1 oz silver at just 6,250 coins. The Majestic Unicorn of Scotland, as this beast is known, was added to the Scottish coat of arms in the 12th century by William I, and adopted into the English royal arms by James I of England after he united the two thrones of England and Scotland with formation of the United Kingdom. 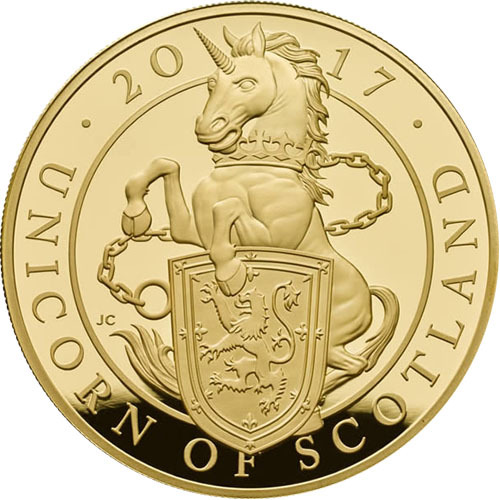 On the reverse of all 2017 1 oz Proof British Gold Queens Beast Unicorn Coins youll find the majestic image of the Unicorn. This unbridled beast is featured with a crown around its neck and a long chain coming from it. The unicorn stands on its hind legs with front hooves over the Royal Banner of Scotland. The obverse of Queens Beast coins from the Royal Mint features Queen Elizabeth IIs effigy. Created in July 2015 by Jody Clark, it is the latest fifth-generation depiction of the Queen as monarch of the United Kingdom. If you have any questions, please dont hesitate to ask. JM Bullion customer service is available on the phone at 800-276-6508, online using our live chat, and via our email address. The spot price of gold is updated throughout the day on our homepage, so check it frequently!